Ian is in preschool now. I know I can’t believe it either. His school is having little Halloween parties on two days. That way everyone gets to participate, since it is preschool, not everyone goes everyday. The day that he gets to attend, Wed., is my day off! That means I get to go too! Whoo Hoo! The great thing about him going to preschool at a private school with about twenty students is that I can make treats for the kids! While browsing the blog Ginger Snap Crafts, I came across a guest post by I Dig Pinterest. It was a recipe for Gooey Caramel Apple Monstercorn. I just knew this would be the treat I wanted make for the kids at school. I thought about just putting some in little plastic bags, but realized that is a bit too simple for me. So I designed these popcorn boxes. 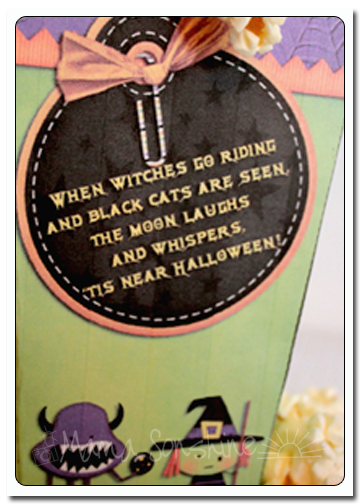 I used the graphic from a couple of Halloween kits from Just So Scrappy. You can download this printable here. The PDF file has two pages to print on cardstock or other heavy-duty paper. Each page is for two sides of the popcorn box. Simple cut each out and glue/tape them together then secure the bottom (download includes instructions). 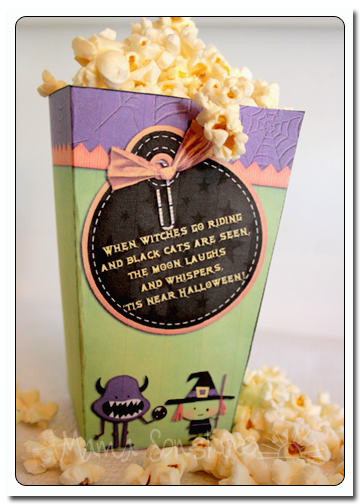 Categories: Food, Halloween, Parties, She's Crafty, Toddler Life | Tags: Apple, Caramel Apple Popcorn, Caramel corn, Children, cooking, Family, food, Free Halloween Popcorn Box, Free Popcorn Box Printable, Free Printable, Free Printable Popcorn Box, Halloween, Halloween Popcorn Box, Halloween Printable, Holiday, Parenting, Pinterest, Popcorn, Toddlers | Permalink. LOVE this! So cute and über crafty! Thanks Connie! I hope the kids like it too!